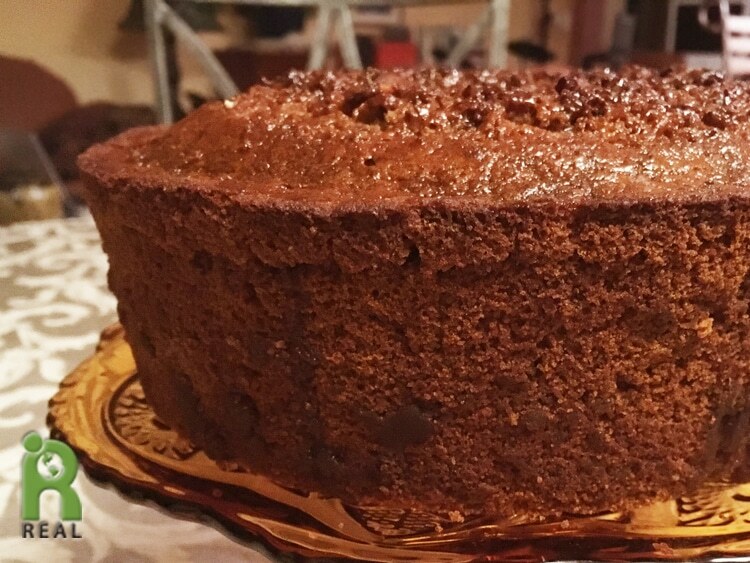 To end your traditional Rosh Hashanah dinner, try this Honey Cake made vegan, without honey! You may want to start that dinner with our gluten-free Round Challah or Braided Challah, egg bread made without eggs, schmeared with our chopped liver, made of course, without liver. Here’s to a sweet year. 1. Preheat oven to 350oF. Grease two 8×4 inch Baking Pans, one tube pan or 2 loaf pans. You can use any size pans you like. The size and shape will determine how long it needs to cook. See step 11 below. 2. Cream sugars with vegan butter in a medium size bowl. 4. Beat at medium speed with electric mixer until or by hand until well blended. 5. Combine flour, baking powder, baking soda, cinnamon and nutmeg in a large bowl. 6. Gradually add the dry mixture to the wet mixture, beating at low speed until blended. 7. Stir in coffee (or hot water). Mix well. Batter should be thick. 8. Add remaining 1 cup of hot water, ½ cup at a time, mixing well in between. Start on slow speed each time to incorporate and then go to medium speed to make a smooth batter. 9. Stir in the nuts and dried fruit. 10. Pour batter into greased pans, filling each halfway. 11. Bake for about 40-45 min or until toothpick inserted in the center comes out clean. Turn off oven; leave cake in oven for 10 min to gradually cool (prevents cake form falling). Small cupcakes will take about a half hour. One large round will take about 60 minutes. If you make one large cake, cover the top with foil or parchment paper after 30 minutes. 12. Remove cake from oven and allow to completely cool. Remove from pan and brush generously with warm agave.